Credo is here to support businesses who are looking to find consultants as well as consultants looking for more paid gigs so that they can either grow their businesses or keep paying their rent without working for someone else. One of the most important lessons you can learn with an online business, I think, is by learning to listen to your customers. Do you want user profiles? How do you feel about referring leads you cannot take to Credo? Part of this email was to get some help thinking through business structure issues, but I also wanted to make sure that shipping new features like User Profiles would be well received. I chose to conduct a survey using the free version of SurveyMonkey, which allows for 10 questions and easy analysis of the results. 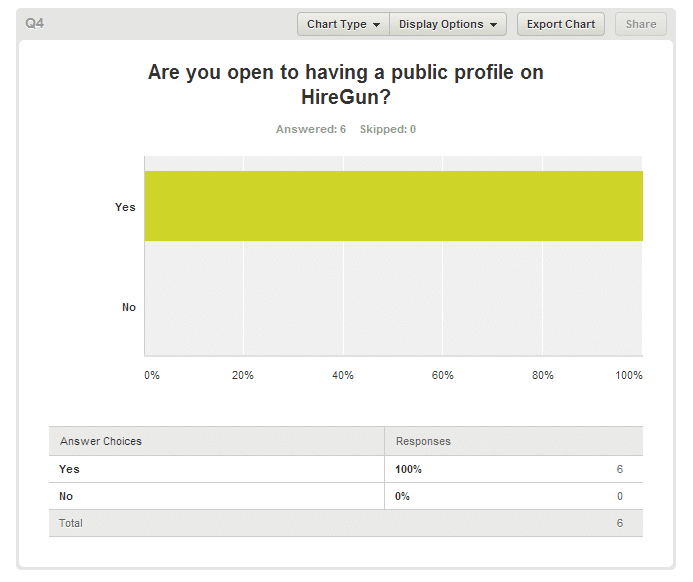 Then I sent the survey link out to my list of consultants using MailChimp, which is my email marketing tool of choice. I sent the email to 38 people and received 11 responses. Honestly, it was less than I had hoped for but with the new Promotions tab in Gmail affecting open rates I am willing to accept about 30% of the recipients giving feedback. In my email to consultants this week, I asked them to please drag the email to their Primary tab so that Credo emails go there instead of Promotions. Maybe I’ve been around the Moz crowd too long, but I (John) have come to greatly value transparency with others. So, I shared with the consultants not only the traffic numbers from the week but also that they asked for user profiles so I shipped them live today. I’ve asked them all to provide their info and I will slowly be integrating them into the site over the coming week or so when I have some spare time.